Losing someone dear, it’s the the tough side of life. Why did this have to happen? What good does it do? If someone dies whom you love very much, the reality of it can be so difficult that you can’t deal with it. You have to close yourself off, put walls up; I’m not here! It is the greatest blow you can have. You dearly love someone and suddenly, they are gone. Just like that. Taken out of life or after an illness. Wham! You get an unprecedented blow and are a complete and total mess. Sometimes you continue to go through your daily life as if nothing has happened. And then the truth hits you; that cold, cruel truth slowly finds its way inside. The person you dearly loved is gone. Forever. It’s unavoidable. It’s rock hard. The loss of someone dear to you confronts you in one fell swoop with the harsh reality of life. Life is limited. At some point, it stops. Learning to live with that is perhaps one of the greatest of life’s lessons. I couldn’t understand it for a long time: why do people have to die? Why do people have to deteriorate to finally die an undignified death? Why does the life just get taken from someone? In the spiritual and religious world there are answers to these questions. Still, these answers are never enough. They give little comfort. The harsh reality is that you have to miss your loved one. Never hear his/her voice again. Never touch each other again. Forever. Maybe you will be reunited after your death, but that doesn’t help you much now. It offers little consolation. People are logical creatures. When you have lost someone you dearly loved, you close your heart off. It hurts so terribly and you feel so cheated by life! To never have to feel that way again, you make the decision: “I won’t open up my heart to others. The chance that I feel such pain again, is too big!” To protect yourself, you close off your heart and don’t allow such intense feelings of love any more. Now, when you do the MIR-Method, you will slowly but surely let go of this decision. The old pain will disappear and your ability to deeply love, will return! Emotions that are not supposed to be there, are released when you do the MIR-Method. That’s why you may experience grief, or anger. Without knowing where it is coming from, you have periods with intense feelings. The best thing you can do is surrender yourself to them. Feel your grief, give yourself the space to cry. If you’re angry, throw it out there! Hit a pillow or run up and down the stairs. Know that emotions want to be seen and heard. This is the only way to solve this. Then you are really working on dealing with them. The MIR-Method helps you to cope with the severe pain of this intense period. And, it will pass! Do you recognize yourself in this? Has the MIR-Method supported you? Please let me know below! Press “End” to immediately go to the reaction form. I wish for you to be able to cherish your loved ones, whether they are still alive or not. Wishing you strength, love and lots of comforting! P.S. Please feel free to forward this article to other people! You will find the icons for Facebook, Twitter and Linked-in to the left and below. Thank you! I am ever so happy that I shared it with everyone! Thank you for embracing the MIR-Methode! I hope it will bring you much good! I have yet to experience the loss of a really loved one. However, it is my understanding that death, like birth is an act of creation. Additionally, just before we are to fully cross over the other side we are asked one question…the most important questions we’ll ever be asked…”Do you want to go back?” If on a soul level we still have things to work on we can come back. But if it is decided, from the soul level, to move on, then it is a perfect “death”, because there is nothing more to “remember” in that particular incarnation. I can recommend the following book: “Home With God – in a life that never ends” by Neale Donald Walsch. I understand that this article deals with the emotions on a physical level, and I believe that a full grieving process is crucial to go through…”The Wheel of Life” by Elisabeth Kubler Ross may be of help. Thank you for adding the wonderful works of Mr. Walsh and Mrs. Kubler Ross! Yes, the MIR-Method works on both the physical and emotional level. I understand what you write and it may be comforting, but once you lose a loved one, the bitter reality of it, can have quite a strong bittering effect on people. I truly hope it will take you a long, long time before you have to experience it. I lost all my loved ones, including myself, more than half a century ago when I was very little. We all went on living, sort of; we didn’t notice we were dead, every last shred of love beaten and screamed and despised out of everyone. Or so it felt. Fortunately, even this kind of loss without “real” loss seems to be addressed by the Mir process. After just six weeks of applying it, it’s too early for an account, but what I can say at this point is that many things start moving and shifting inside and minor physical kinks are beginning to clear up. Yes, you are so right. Emotional loss of people is also addressed with the MIR-Method. Reading your ‘story’ it looks like you have had quite a sad life. I am glad you notice a shift inside. I hope you will start to notice soon that it will give you much more relief and your life will start to feel much lighter! Indeed, dear Mireille, a sad story and a story of sadness. And there is anger, of course, there is guilt and shame and, worst of all, fear. All because of too much violence so many years ago. It doesn’t make much sense to me, nor do the explanations I’ve heard and read about or found myself. But doing the MIR-Method steps, it seems to me there is much to look forward to. After so many attempted solutions in the fields of therapy and spirituality, my impression is that the MIR-Method might finally be simple and straightforward enough to return this heart to what it was when it came here. I truly sympathize with you. It feels like there is much healing going on in Germany and I am very glad about that! Please look at all your previous attempts of healing as building blocks. They were not in vain, but were always building you up, no matter if you felt hardly anything. 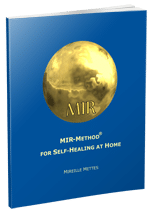 The MIR-Method can now build upon every therapy you have done before, so all the work you have done previously, will help the MIR-Method to work stronger. Well done! Hope you keep your hopes up and keep looking at all the people that are with you and that are also lifting themselves up. There are millions of them!